Built to the highest standards of design, performance and quality, this new Horizon RP110 raised pilothouse motoryacht is a showcase of superyacht design and amenities. Elements of the ocean blend into a contemporary design, giving the interior a relaxed yet sophisticated, modern beach house feel. Within a 25’ beam, she offers five voluminous en suite staterooms, including an on-deck Master, plus private crew quarters in the bow. When it’s time to enjoy the outdoors, the RP110 features a hydraulic tender garage with a Hi/Lo swim platform that serves as a flexible beach club space as well as an expansive open flybridge for entertaining guests al fresco. Featuring exterior design by JC Espinosa, the Horizon RP110 superyacht exudes sophistication in design and style; her large, sweeping windows provide unobstructed views that, in combination with her fluid style lines, creates a sleek and modern profile. The double chine hull design from naval architect Donald Blount ensures excellent sea keeping, with stability and enhanced hydrodynamics to minimize drag and improve overall performance. With the RP110, you will cruise in the utmost comfort and luxury. United Yacht Sales New Jersey would love to guide you through a personal showing of this 110' Horizon Rp110 2018. 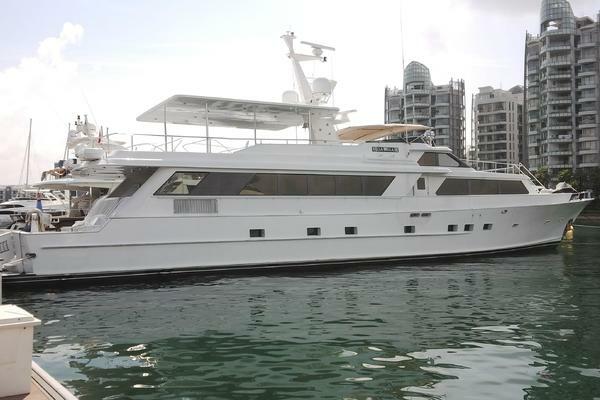 This yacht for sale is located in Fort Lauderdale , Florida. For pricing details or a showing please contact us by filling out the form on this page and we will get back to you shortly!